Today I am going to break an unwritten protocol: not to use my blog to showcase my own poems. The reason: my emotional reaction to the release of the Canadian Truth and Reconciliation Commission’s (TRC) report on the residential school system for aboriginal children that existed for about one hundred and twenty years. These schools subjected these children to unimaginable abuse and in thousands of cases, death. More than seven thousand survivors of that system told their stories to the TRC. Residential. Say it. Spit it out. each syllable, each foreign tongue. Wabasca, Stand-off, Cariboo, and more. to playgrounds filled with gravestones. no sunrise to break it. The reality and legacy of Canada’s infamous system of residential schools for aboriginal children ripped from their families is not new. Prime Minister Stephen Harper issued an official apology in 2008 and the major churches involved in running the schools have also apologized. What is new is the shocking phrase uttered by Justice Murray Sinclair when he announced the findings of the TRC on the residential school system in Canada. This phrase: that the residential school system amounts to nothing short of cultural genocide. That phrase which has resonated across my country for almost a week now began, for me, to turn an intellectual reality into an emotional reality. I was in Ottawa during the closing events for the TRC which included a stirring concert by seventy four year old Canadian/American Cree activist Buffy Sainte Marie. Accompanied by the harmonic disorientation of her trills that landed like exclamation marks in the heart, Sainte Marie’s songs were a challenge to the social, political and environmental status quo. They sent me reeling from the concert in front of the Ottawa City Hall back to my room to look up more details on the residential schools. And the good old cliche that a picture is worth a thousand words proved more true than I could imagine. I found a slide show of images of native children at residential schools. 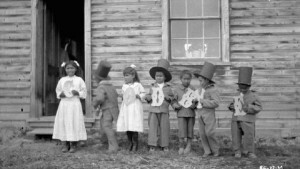 The image that electrified me, one that I can’t as of yet find again, was of native boys who could have been as young as six, I figure, sitting on steep steps in front of a school dressed in suits and top hats. The horrifying absurdity of that picture triggered an emotional response so strong it could only be satisfied by writing my poem. It was only as I let the sounds of words lead me into the poem that I realized that top hats used to be made of beaver fur. The impact of this – that instead of learning how to trap beavers these children were wearing top hats that could have been made from them. That irony seemed almost too much to bear. Then all the other images of what they lost in those schools took over. A friend who read the poem earlier today asked why I had a nun in the poem not a priest. It could have been either but one picture I saw of a stone faced nun in full habit, towering over her native students, haunted me as I wrote the poem. The knowledge that nuns, as close to a mother figure as some students would experience for years, were also cited in some stories as perpetrators of awful abuse seemed to suggest a nun be in the poem. Not a priest. Poems of greater concern or protest are difficult to write. If not enough distance is created in the poem they can slide too easily into a rhetorical rant or propaganda. American poet Stephen Dunn has a great chapter on the perils of writing these kinds of poems in his book Walking Light. Whether or not I succeeded according to his standards I don’t know. But in a week filled with international news stories of FIFA corruption and the Vanity Fair pictures of Caitlin Jenner, among countless others, I wanted to publish a raw poem about a hugely important Canadian story, regardless of the risk! This entry was written by Richard Osler, posted on June 7, 2015 at 8:58 pm, filed under Poetry and tagged Richard Osler. Bookmark the permalink. Follow any comments here with the RSS feed for this post. Said with heart and meaning. Darkness asking for light, and venturing out into it with eyes and feeling open. Thanks, Richard. Beautifully expressed. My girlfriend’s mother was in a residential school – will share this with her on FB. You seem concerned on whether or not this is a political propaganda piece. It is political, however, it’s far from a rant to me. You’ve distanced yourself from not using the “I” POV. There’s also a beat and musicality to it making it flow – meaning it doesn’t sound shouty. I also, enjoyed your use of doing math, with syllables – that makes the image of large numbers of children pop into my head. And the information about the beaver fur used for top hats is just so bizarre and almost satirical, that it needs to be included in the poem. I truly enjoyed it, and the rhythm sits well with me. Thanks Colleen! Sorry it’s taken me so long to reply!